As one of the fastest growing pharmaceutical organizations, Pharmalink works to have the finest range of facilities to satisfy the market demands of our SKU’s and to serve our customers efficiently. We are proud to boast one of the best storage facilities across the UAE, with a total warehouse capacity exceeding 100,000 square feet. Our warehouses are temperature mapped with the latest technology in order to maintain product integrity and reputability. A special cold storage area is available in both Abu Dhabi and Dubai warehouses, which allows us to store products across a wide range of conditions. Our logistics and supply team knows the unique storage conditions of each product and handles them accordingly. Pharmalink promises to provide a 24-hour maximum supply to all customers across the UAE. Our fleet is comprised of over 22 MOH certified delivery vehicles that are GPS tracked with automotive data loggers ensuring safe transit and delivery. 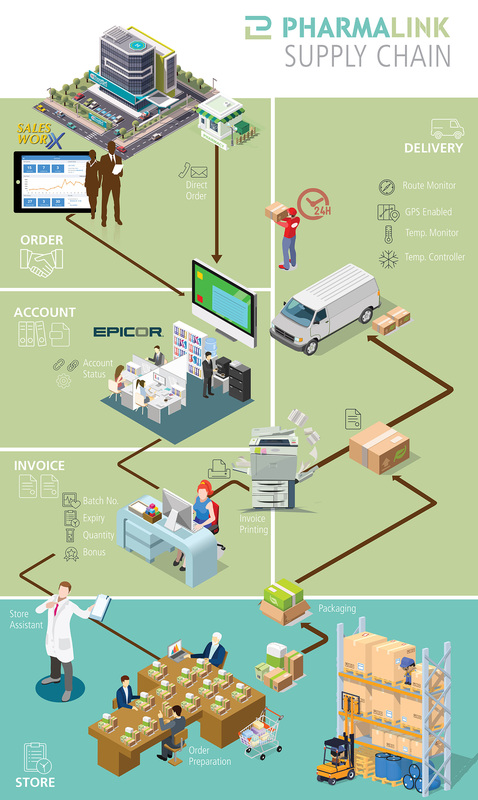 Pharmalink assures its partners and customers that all our products are delivered through a strictly controlled and monitored supply chain process. Our latest pride is the ISO certification issued for our facilities to stress the high standards that we provide.